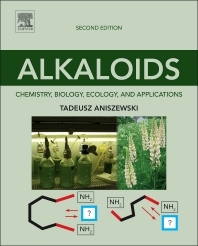 Alkaloids - Secrets of Life: Alkaloid Chemistry, Biological Significance, Applications and Ecological Role, Second Edition provides knowledge on structural typology, biosynthesis and metabolism in relation to recent research work on alkaloids, considering an organic chemistry approach to alkaloids using biological and ecological explanation. The book approaches several questions and unresearched areas that persist in this field of research. It provides a beneficial text for academics, professionals or anyone who is interested in the fascinating subject of alkaloids. Each chapter features an abstract. Appendices, a listing of alkaloids, and plants containing alkaloids are all included, as are basic protocols of alkaloid analysis. Former (retired 2014) Professor in Applied Botany, University of Eastern Finland, Faculty of Science and Forestry, Department of Biology, Research and Teaching Laboratory of Applied Botany, Joensuu Campus. Internationally known, Chair of Phytochemical Section of the Botanical Society of America. Lifetime scientific title of docent in applied botany. Gold Medal for a Long Service to the Scientic Community.